3 rings to share today - Twice Around the World (TAW) Wire Wrap Ring (Turquoise), Wire Wrap Rose Ring (all wire) and an Adjustable Ring, with my favourite gemstone, tourmaline. I remember taking pictures of these 3 rings last week but I must have lost or misplaced them while transferring files from the old laptop. Can't find them last night so I retook these pictures this morning. 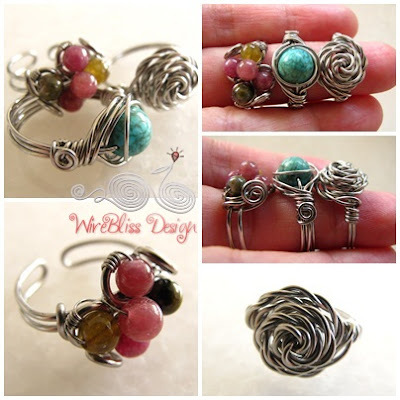 Planning to refine the technique for the newvAdjustable Ring (bottom left pic above) and hopefully to come up with a new step by step wire jewelry eTutorial :) Been a while. Close up of the TAW Ring. This I made with 22ga wire as it is easier to work with. 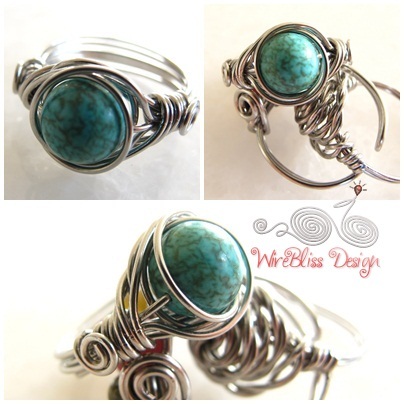 If you have my tutorial for this TAW Ring, you will know why :) Its quite a handfull to hold 6 wires on one end and another 6 on the other end and at the same time shaping the ring shank and maintaining the wires at their position. This one is another Japanese Bead Adjustable Ring completed earlier. A hit because it is easy to put on and eye-catching. Shuku, I notice you've been busy traveling here and there & singing. But hey, where can you find work with traveling together? Enjoy! Can't wait to see what you create next.